An original signed contemporary watercolour of a very cute little brown hare. " A kiss for a cornflower ". As per usual I've included lots of images so that you can see the painting in its entirety. This listing is for 2 hand painted watercolour paintings by watercolour artist Laura parkes they measure roughly 6x8 inches. They are UMFRAMED and UNMOUNTED. My paintings are posted by royal mail 1st class post in a plastic sleeve backed with cardboard. I also takes requests for any wildlife to be painted and I can also do larger sizes on request. CAT - original ink / watercolour painting. Dispatched with Royal Mail Signed For® 1st Class Letter.Unframed and unmounted , signed . Size 210 X 297 mm. 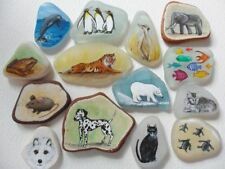 This listing is for 3 hand painted watercolour paintings by watercolour artist Laura parkes they measure roughly 6x8 inches. They are UMFRAMED and UNMOUNTED. My paintings are posted by royal mail 1st class post in a plastic sleeve backed with cardboard. I also takes requests for any wildlife to be painted and I can also do larger sizes on request. These are painted to order so there might be slight diffence sin colours and detail but this makes each set individual. This listing is for 1 hand painted watercolour painting by watercolour artist Laura parkes it measures roughly 6x8 inches. It is UMFRAMED and UNMOUNTED. My paintings are posted by royal mail 1st class post in a plastic sleeve backed with cardboard. I also takes requests for any wildlife to be painted and I can also do larger sizes on request. Painted on A3 (42cm by 29.7cm) 140lb acid free watercolour paper using Winsor & Newton Artists' Watercolour paint. An original watercolour painting. This is not a print. I list regularly in a variety of sizes and subjects. It is of a couple of Mackerel Fish by Artist Sandra Mason. The painting is signed and titled on the front. I hang the canvases without any string directly onto a nail. It will be signed on the front. I regularly paint collectible 5" x 7"oil paintings on black backgrounds which can be hung in any pattern. 'TABBY CAT'. BY ARTIST EMMA HOGAN. Emma Hogan was born in Bath in 1976. Deciding to further her artistic career she attended Newport University to study animation in which she gained a BA with Honours. Original watercolour & pastel artwork depicting a fox head study. Inframed. Completed on good quality cartridge paper. Size approximately 38cm X 28cm. Signed and dated by the artist as this is an original piece of artwork. Dispatched with Royal Mail 1st Class. A freshly painted original watercolour painting. This is not a print. Hand painted on A4 (29.7cm by 21cm) 140lb textured watercolour paper using Winsor & Newton Artists' Watercolour paint This item comes with a mount, in a clear presentation bag to allow you to frame to your own taste. 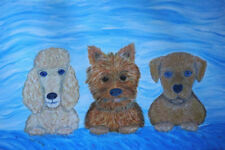 Please look at my other bright and colourful paintings. I list regularly in different sizes and subjects. The painting is signed and titled on the front. I have been a professional Artist for 20 years and Greeting Card Designer for 9 years now. 100 % hand painted using high quality Winsor &Newton oil paints. A large original contemporary signed watercolour painted in a semi loose style with fun spontaneous brushstrokes. As per usual I've included lots of images so that you can see the painting in its entirely. An original watercolour /pencil painting. Suzanne Patterson. Signed and dated. P ainted with Sennelier artist's watercolour paints on good quality paper. Original painting of a Dachshund dog. Overall size: 10"/ 8" approx. Original Oil Painting of a Wolf Portrait painted on canvas board 25 by 30 cm by Internationally recognized Wildlife Artist A T Jones. A certificate of authenticity signed by myself included as I do not do prints only originals. THIS IS AN ORIGINAL HAND PAINTED OIL ON SLATE PAINTING OF A BRITISH BUMBLE BEE ON THISTLE.THIS SLATE IS FOR INDOOR USE BUT I CAN VARNISH IT FOR YOU AT NO EXTRA COST TO HANG OUTDOORS. I AM A DEVON BASED ARTIST WITH OVER 500 SLATES SOLD. Original watercolour painting of a Puffin. painted on high quality watercolour paper, using artist quality paints. Initialled on front, signed and dated on back of art work. – it is not print. All of my paintings are original and a one off paintings. I am an artist based in Cornwall and live next door to a dairy farm on the edge of Bodmin moor ! I paint in a range of techniques and love to paint all different subjects but esp wildlife in watercolour! A Whippet, greyhound, lurcher, lovely water color and ink PRINT. A Quality Print taken from an original watercolor and ink painting as painted by myself. This is a print. Printed on quality water color paper 300 gsm. Original watercolour painting of a Hare. painted on high quality watercolour paper, using artist quality paints. Size of mount is 10" x 8" ( Print size 7" x 5"). Original Wild Animal Watercolour and Coloured Pencil ACEO Painting. Red Fox - "Rufus". (An open edition high grade signed Giclee print from my original watercolour study of a cute hare with utterly gorgeous ears :). " Century hare ". Supplied with a signed certificate of provenance. ELLE SMITH ART.ORIGINAL SIGNED NEW ANIMAL WATERCOLOUR PAINTING.A3 HIGHLAND COW"
HIGHLAND COW. Elle Smith. I run every part of it myself and am proud to be the person solely responsible for every part of each piece I create. P ainted with artist's watercolour paints on good quality paper. Original painting of a Cavalier King Charles Spaniel. Signed by the artist Patanne Fairfoot. Overall size: 9"/ 7.5" approx. P ainted with artist's watercolour paints on good quality paper. 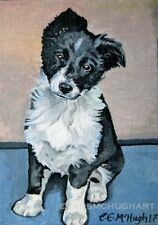 Original painting of a Terrier dog. Size:11"/ 8" approx. ELLE SMITH ART.NEW ORIGINAL WILDLIFE ANIMAL WATERCOLOUR PAINTING. A3 "BUSY BEE"
Elle Smith. I run every part of it myself and am proud to be the person solely responsible for every part of each piece I create. I love paint and I do so daily around my young family and 4 small children. A lovely watercolour of "THistle and bee" inspired by birds and painted on a white quality textured, 300 g/m2, acid free quality watercolour paper using Winsor & Newton watercolours and pen. Original unique watercolour painting. There is also a white area around the painting which shows the painting off very well. This painting is also available in a much larger A3 size. A Whippet, greyhound, lurcher, PRINT of a watercolor and Ink painting. 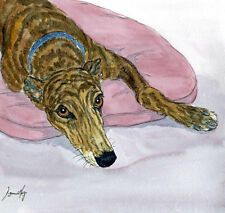 Whippet greyhound dog Watercolour/ink Painting by Bridgette Lee.